Visit the Bell Tower, one of the largest musical instruments in the world, located in the heart of Perth in vibrant Barrack Square. Also known as the Swan Bells, the bell tower contains twelve bells made in the 14th century for St Martin-in-the-Fields church in London's Trafalgar Square. 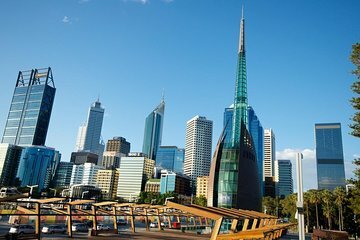 Learn how the bells came to Australia, discover the art of bell ringing, and soak in panoramic views of the city, Swan River and Elizabeth Quay from the open-air Observation Deck. Make your own way to Barrack Square to enter the Bell Tower at the time of your choice. As you tour the building, learn about the history of the bells from 14th-century London to modern-day Australia. Experience an interactive demonstration on the art of chiming a bell with chiming demonstrations taking place Monday through Saturday every half an hour between 10:30am to 2:30pm. You even have the option to record a free video postcard to send to your family and friends. You'll also receive a bell chiming certificate as a souvenir. Please Note: Every Monday and Thursday 12pm-1pm, the bell ringers are ringing the bells in concert; no chiming demonstrations take place during these times. If you are planning a visit to hear the ancient bells or practice bell chiming, please contact the supplier in advance to reconfirm the ringing times. Days and times are subject to change without notice. I would say a must do whilst in Perth! A really fun trip, which is also amazingly interesting. being bell ringers ourselves we wanted to see this set in action. We were delighted to not only see these bells from London and Ascot racecourse, we were allowed to play them. A really exceptional experience.